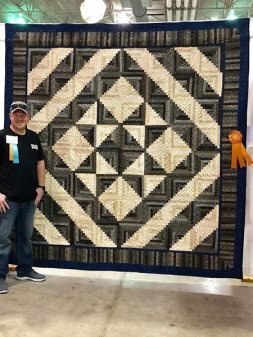 Stone Creek Quilts is a professional quilt shop located in Kountze, Texas. 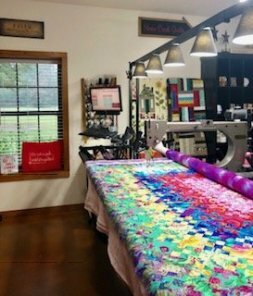 We proudly use a Gammill machine equipped with Statler Stitcher in our quilting process—the best longarm computerized quilting technology available! It allows us to make precise and accurate stitches on blocks and borders, as well as beautiful and unique edge-to-edge designs. Turnaround is typically 6 weeks in shop time for quilting only. We also are able to purchase edge-to-edge patterns to suit any needs. that started out as a passion has now turned into a business! 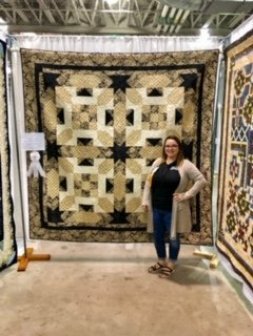 At Stone Creek Quilts, we are committed to providing quality longarm quilting services at competitive prices along with excellent customer service. 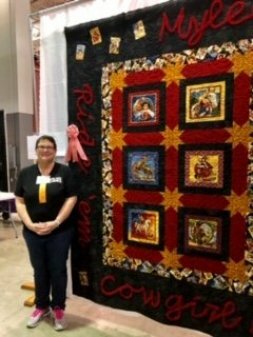 As quilters ourselves, we are passionate about the craft and understand the amount of time, effort, and cost it takes to create a masterpiece that will be treasured from generation to generation. Edge-to-edge is our most popular and most cost-effective way to turn your quilt tops into beautiful, usable quilts. To estimate cost for edge-to-edge quilting, multiply the width of your quilt by length (in inches). The result is your total square inches. Then multiply that number by .015. Batting and thread are additional. Example: You have a quilt top that measures 66" wide and 86" long. 66 x 86 = 5676 square inches. 5676 x $0.015= $85.14. You will need to add the cost of batting, thread, and any extra services (such as binding) to estimate your total cost. You can always call us for help – 409-926-1222. Minimum Quilting Fee: Our minimum quilting fee is $50 for quilting service only. Thread, batting, and other services are additional. Always ensure that the backing fabric is at least 4 inches bigger around all four edges of the quilt top. This makes it easier to pin the backing fabric to the canvas leaders and ensures that we won't run out of backing fabric during the quilting process. If you are unable to come to our store in person to drop off your quilt top, we also allow you to mail it tous. All that we ask is that you call us beforehand so that we can be expecting it.